This is a 44 inch wide by 9 feet high mural for a client in Utah County. 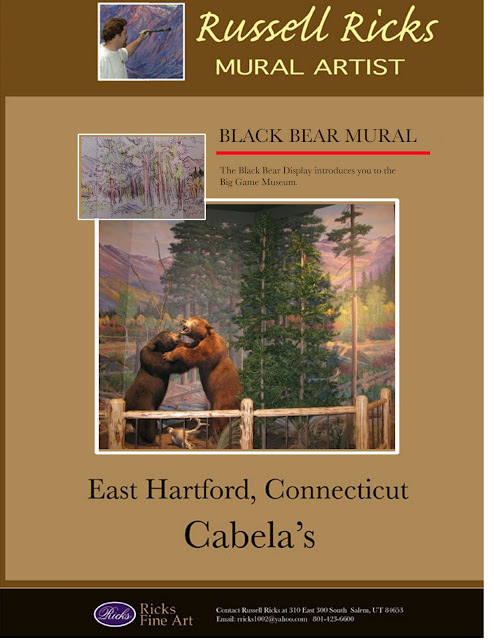 Click on the photo to enter site of the current mural project we are working on in progress by Ricks Fine Art. This 9ft, by 73 ft, mural was began in January 2011, yet the majority of it was painted from mid April to June 7, 2011. APRIL 2011. Painted on wall inside industrial building to add color to an otherwise drab space. 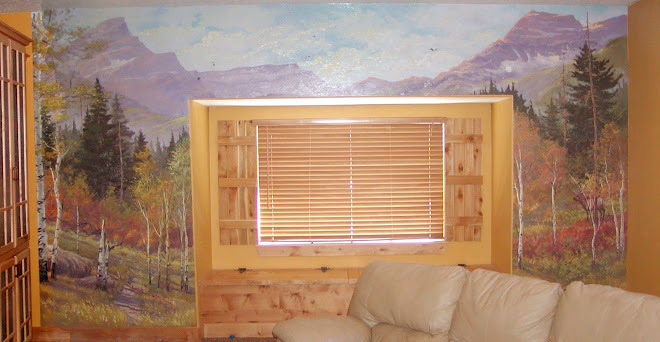 To see the entire finished Mountain Vista Mural, click on the mural sketch picture. This mural was painted from February to June of 2006. Most of it is now covered up with shelving and various industrial equipment, yet you can still se bits and pieces of the mural wich measures 25 feet high and is 150 feet long. The subject is Mount Nebo, one of the main mountain features along the Wasatch Front. People still talk about the project today. Individuals in the fossil fuel and natural gas industries from all over the world enjoy the mural. Another section of Intelliserv Mural created in 2006. This mural was created in 2001. We started it one month before 9/11. The project is eighteen feet high by One Hundred-Twenty feet long. The project took 3 1/2 months to complete. After a professional mural painting career of thirty-three plus years, we have heard much positive feed-back from many satisfied customers in a variety of interior settings. Unfortunately we did not take the time to document our customers reactions to our art work. Looking back over the years, we now realize that had we followed up each mural project with a control study, asking the clients employees specific questions regarding the value of art in the workplace, this would have been a valuable resource for us. Some studies are available and this year, we intend to conduct such a follow up study after each mural we produce. One example is found at the following internet address; http://www.nhbca.com/news_031208_workart.php (ART IN THE WORKPLACE, Survey Reveals Workplace Art Collections Are Valuable for Business). Reducing stress (78% agree, 8% disagree and 14% neither agree nor disagree). Increasing creativity and productivity (64% agree, 11% disagree, and 25% neither agree nor disagree). Enhancing morale (67% agree, 13% disagree, and 20% neither agree nor disagree). Broadening employee appreciation of diversity and encouraging discussions, and expression of opinions (77% agree, 11% disagree, and 12% neither agree nor disagree). Enhances the work environment (94% agree, 3% disagree, and 3% neither agree nor disagree). Evidences the company’s interest in improving the quality of life in and out of the workplace (84% agree, 6% disagree, and 10% neither agree nor disagree). Helps to build customer (65% yes and 34% no) and community relations (73% yes and 27% no). Leads to networking opportunities (52% yes and 47% no). This year, we have enough work lined up with our Novatek customer to keep us busy for twelve plus months. Thus, conducting a control study would be very valuable and it would be a shame to pass this opportunity up. Although we did not take the time to gather information in the past, I recently discovered a very interesting coincidence. First, I must note that we have been producing murals for Novatek since the year 2001. Upon looking at Novatek's website, I discovered a chart which illustrates the number of patents awarded Novatek for inventions, since it's founding in the 1950's and up through 2010. As you analyze this chart, you will observe a slow but steady increase in patents awarded Novatek, from the fifties decade to the year 2000. And interestingly, in the most recent decade, you will notice a drastic increase in this number. In other words, the largest percentage of patents awarded for inventions to the companies credit, were in the past ten years, as compared to previous decades. Pretty impressive. To date, Novatek has a company total of over five hundred patents since their founding and to their credit. It has been said that the company CEO makes more trips to the patent office than the average person goes grocery shopping. In observing the companies productivity first hand, I can tell you that it is hardly an exaggeration. In making this observation, an individual might ask himself, "What is it then, that has caused such an increase in productivity and company success?" In the past decade and through my own personal observation, Novatek has done several things to improve the work environment for there employees. First I would like to add that I have never heard a Novatek employee say anything negative about the company. I get the impression that morale and productivity has always been high, even in previous decades. Even though the work environment is already top notch, Novatek continues to look for ways to improve their environment. Why? Because all these "extras" improves productivity. Do the math. An increase in productivity increases profits. After we painted our first mural for Novatek, beginning August 2001 and added framed paintings in their conference rooms and offices, The employees observed that is seemed to add a whole new energizing dimension to the workplace. 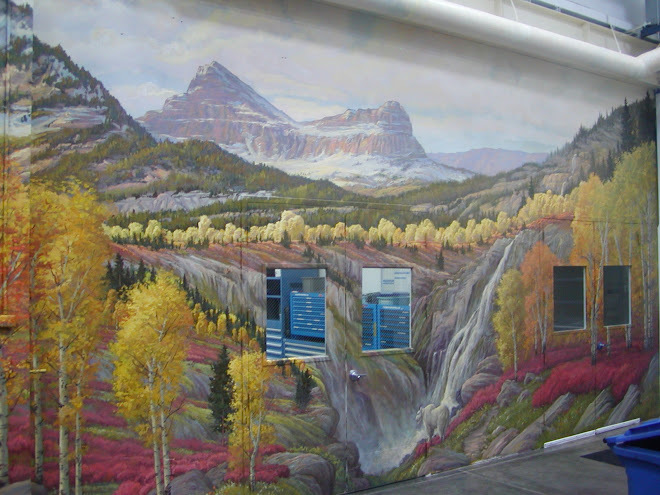 One of Novatek's customers from Texas once told me, "When I come to Novatek for business, the first thing I usually do is go to the wall where a mural is painted and soak in a little inspiration. It helps me relax and prepare myself for the business at hand." Since 2001, the company also began to add dozens of sky lights to their rooftops, flooding the interiors with natural light. Their shops are always as clean as a hospital, even their machine shops. Their HVAC system is state-of-the-art, all adding to the employees comfort. Novatek is kind of like a state-of-the-art business incubator. They are continuously developing new technologies from the ground up and creating working prototypes. Everything is provided for them in house for their convenience, from mechanical tools and equipment, marketing research tools, intellectual properties and legal professionals, etc. All these "extra" conveniences, including our murals, seem to have weaved a decade of more successful productivity and profits. Coincidence? 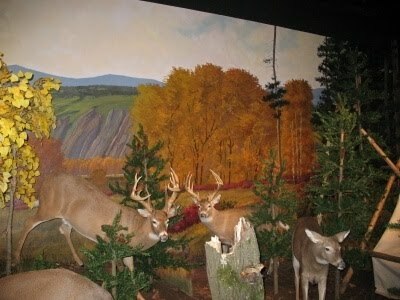 We like to think that Ricks Fine Art Murals has now become an important part of the companies productive fabric. When you think about it, why do corporate officials wear business attire, drive expensive-looking cars, polish their shoes, press their shirts and pants and groom themselves nicely when meeting important customers or making presentations? Is it not because they have learned the right business attire creates a very professional first impression? It has also been shown to improve sales, because it creates an image of success. If spending the money to "dress up" the corporate building with the above described improvements will increase profits, then does it not make sense to do it? In this respect, high quality murals and artwork is the business attire and grooming standard of the corporate professional. Our mural product is unique. It is more like a gargantuan easel painting than the typical large-scale postery, commercial-looking wall graphic. During my professional career as an artist, seventeen of those years were in the sign industry, supplementing my fine art career for a while. 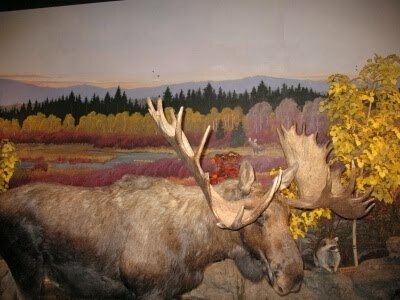 Our real passion is museum quality mural art with heart-felt expression. Anything less than that would seem to us like just another commercial sign job and we don't want to do another sign. We strive to reach beyond that. 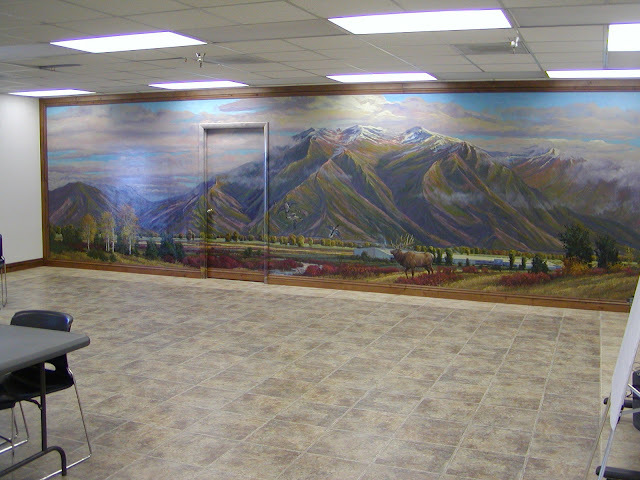 When we finish a mural project, it is only after we have done everything we can to give the customer our very best. Judging by the data in this article, our "very best" appears to contribute to a companies success. This is just a bulletin to inform the public that our various mural blogs are better organized and easier to navigate. If you go to the main blog http://www.themeroommurals.blogspot.com , you can find links to all our mural sites we have posted. You will find it easy to navigate just by clicking on the photographs or the typed link. Give it a try. Very soon, we will have an official Ricks Fine Art Murals website which should make navigating even easier. Artist Russell Ricks is a second generation artist from the Don Ricks family. Raised in Rexburg, Idaho, Russell grew up in an environment surrounded by creativity every day. It all began as a young child watching his father Don Ricks painting as a hobby while he provided for the young family running a sign business. By about 1969, when Russell was 9 years old, his father founded a national outdoor plein air painting school called, Painting Vacations. 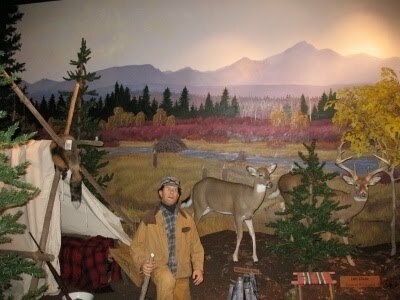 Two nationally renown instructors; Sergei Bongart, a Russian native; and Milford Zornes, a water colorist from Southern Utah, taught in the school along with Russell's father. The school ran for about 15 years, giving a solid art instructional foundation to artist Russell Ricks. Currently, Mr. Ricks is represented in Montgomery-Lee Fine Art in Park City, Utah.